The Bumthang trekking trails lead you through alpine meadows rhododendron forests around the foothills of the snow peaked Himalayas, emerald green valleys and crystal lakes. 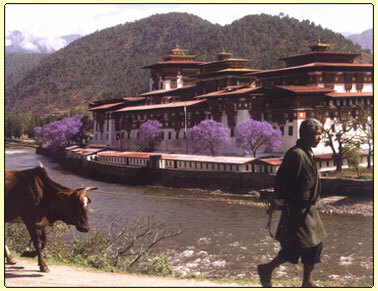 One also gets the opportunity to see a wide variety of flora and fauna of Bhutan. Trekking in Bhutan is unique, unlike anywhere else in the Himalayas. The walks are long and arduous but crystal air, lonely paths and views that defy description compliment them. The trails lead you through alpine meadows rhododendron forests around the foothills of the snow peaked Himalayas, emerald green valleys and crystal lakes. One also gets the opportunity to see a wide variety of flora and fauna. The treks vary from short 3 day walks over relative low altitudes to 3 week long treks which takes one through some of the highest passes in the kingdom of Bhutan. The Bumthang trek is a cultural trek that takes you through villages and heritage sites in the valley of Bhutan. Bumthang Cultrual Trek is through Choekhor and Tang valley, passing and visiting Bumthang's remote villages, ancient temples and even a manor of Ugencholing. This trek is so named because, the opportunities to visit villages and temples are greater than on most other treks in Bhutan. Though it is relatively easy and a short trek, there is one day of a long climb and descend (about 500m) to Phephe La (3360). However, there is no significant altitude gain as with other treks and your night halts are all below 3100m (10,100ft). The trekking or tour of Bhutan can be combined with Nepal trek, tour to Darjeeling and Sikkim or even cultural journey to India like Taj Mahal Agra, Jaipur etc. Similarly Bhutan tour can combined with Tibet ( Lhasa ) or Buddhist circuit tour like Lumbini, Boudhgaya, Sarnath and Kushinagar etc. Which are the birth place, enlighten place, first teaching given place and Pari - Nirvana place of Buddha. Kindly ask us for details. Arrival Kathmandu Nepal, check into hotel rest day. Full day sightseeing in Kathmandu Valley, world heritage sights of Kathmandu, Nepal. Fly to Paro, Bhutan for trekking and tour of Bhutan. Overnight at Hotel. 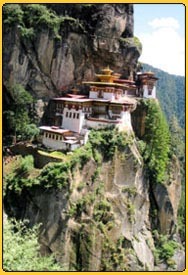 Day 04: Sightseeing of Paro and Excursion to Taktsang Monastery Overnight at Hotel. Drive to Thimphu, Sightseeing of Thimpu, Bhutan Overnight at Hotel. Day 06: Drive to Punakha and Wangdi Photang & Sightseeing Overnight Hotel. Day 07: Drive to Phubjikha (Gangtey) and sightseeing overnight at Hotel. Day 08: Drive to Bumthang (Jakar) via Tongsa Overnight at Hotel. Day 10 - 13: Drive to Paro from Bumthang , sightseeing along the way, Overnight at Hotel. Availability: Every week from March to Nov. (weather permitted), however Dec. July- Aug is not recommended. The trekking or tour of Bhutan Bumthang can be combined with Nepal trek, tour to Darjeeling and Sikkim or even cultural journey to India like Taj Mahal Agra, Jaipur etc. Similarly Bhutan tour can combined with Tibet ( Lhasa ) or Buddhist circuit tour like Lumbini, Bodhgaya, Sarnath and Kushinagar etc. Which are the birth place, enlighten place, first teaching given place and Pari - Nirvana place of Buddha. Nepal Trekking agency registered License no. : 20 / 457. Book our safe trek and tours direct online and save! !